The number of asylum seekers in the world's 38 industrialised countries in 2004 fell to its lowest level in 16 years - but for several of the EU's new member-states the figures rose sharply. The BBC's Central and South-East Europe analyst, Gabriel Partos, examines what lies behind the European trends reported by the United Nations refugee agency, the UNHCR. The world's three largest traditional destinations for asylum seekers - the United States, Germany and Britain - have all registered huge drops in the number of people applying for asylum in recent years. Last year they were overtaken by France as the leading receiving country. In general, the scale of the asylum problem across western Europe is now down to a level last seen in the mid- to late 1980s. The continuing drop in numbers in recent years has been due to a combination of factors: a stricter asylum policy in the receiving countries and greater political stability - or at least a widely-shared hope for a better future - in some of the major source regions, including Afghanistan, Iraq and the Balkans. But Serbia and Montenegro - primarily through Kosovo - remains the second largest source of asylum seekers after the Russian Federation. In spite of this overall downward trend - 19% across the EU as a whole - the EU's 10 new members actually registered a small increase of 4% in asylum seekers last year. Cyprus, Malta, Poland and Slovakia - plus Finland from among the older EU members - actually saw a marked increase in arrivals last year. The UNHCR's spokesman for Europe, Rupert Colville, identified two reasons for this contrasting trend. "Some countries are getting a large number of Chechens - people from the Russian Federation but the majority of them Chechens. "In the case of Cyprus, which has gone up a lot, it's a bit of a local anomaly, really, in that they've had a large number of Bangladeshi and Pakistani students who were in Cyprus, who have then been claiming asylum. It's a sort of disconnect between the migration system and the asylum system." Behind these specific reasons, there is also a broader trend. In many cases the new members - whether on the eastern fringes of central Europe or in the south and eastern Mediterranean - now form the new borders of the EU. Apart from being the first - and often the easiest - point of arrival in the EU, these countries are also becoming increasingly prosperous and, therefore, more of a magnet for would-be asylum claimants. But claiming asylum in itself does not by any means guarantee success. 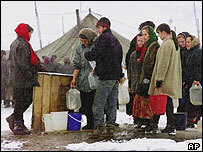 Rupert Colville highlighted the situation in Slovakia, which "is definitely very overburdened with asylum seekers". "It has a very young asylum system, very fragile, let's say. They had 11,300 in 2004, which is a lot for the Slovak Republic. "However, hardly anyone is getting recognised [as refugees] in the Slovak Republic, even though they have a high number of Chechens coming there, whereas in neighbouring countries, like Austria for example, you find a much, much higher recognition rate." Even among the new central European members of the EU there are diverging trends. The Czech Republic and Hungary have been following the downward shift in western Europe, with a massive 52% reduction in last year's asylum claimants in the Czech Republic and a one-third drop in Hungary. Similarly, Bulgaria and Romania - which will form the next wave of EU enlargement - have seen a sizeable decrease. In general, though, the contradictory developments across the EU are a source of concern to the UNHCR. "What is a glaring omission, I think, is any kind of burden-sharing mechanism," says Mr Colville. "That's worrying us, particularly for these new member-states. Obviously, as the new border states, they are coming under some pressure. And there's really no system for the EU to help out countries which are getting their undue share of the numbers." The limited extent of existing burden-sharing mechanisms is less of a problem at a time when the numbers of asylum seekers are down to a level last seen nearly 20 years ago. The danger is that if there is another major conflict that would prompt a large wave of asylum seekers, the EU's new members with their limited resources could easily be overwhelmed. Friso Roscam Abbing, a spokesman for the European Commission, says however that the EU is not turning away from the problem. "We are obviously aware of the increase in the number of asylum seekers in a number of EU member states, and precisely in those who have external borders," he says. The "Hague programme" adopted last November by European leaders said there should be assistance for member states which merely due to their geographical location faced an influx of asylum seekers or immigrants, Mr Abbing noted. "This is where the whole idea of solidarity - very solemnly enshrined also in the European constitutional treaty, in the chapter on immigration and asylum - and burden-sharing kicks in." In 2000, after lengthy negotiations, EU leaders allocated 216m euros (£149m; $286m) to a European Refugee Fund (ERF), to run until the end of 2004. Last year, they agreed to extend the fund for the period 2005-2010. Some 10m euros of the fund can be used in an emergency, to house, feed and offer medical assistance to a sudden large influx of refugees anywhere in the EU. EU leaders have also pledged to develop a common asylum system by the end of the decade, but that may be harder to achieve than handing out money.